It is only March, but I have found the 2008 hockey book of the year. It's too bad I just can't sit down and read it cover to cover. 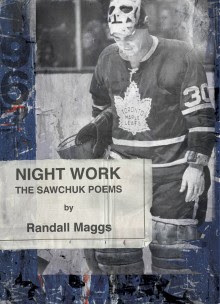 Author/university English professor Randall Maggs (brother of former NHL/WHA defenseman Daryl Maggs) and publisher Brick Books have combined to give us Night Work: The Sawchuk Poems. It is a book that will undoubtedly win countless of industry literary awards and should go down as one of the best hockey books of all time. "Poems," as I call it, is just that. Nearly 200 pages and over 70 individual pieces of poetry that combine to create one long, narrative piece of literary beauty. Yes, I had trouble reading this book. I could only read a couple of poems at a time, and could never sit down and read the whole thing from cover to cover. Yet I thoroughly enjoyed this book. One poem at a time. Some poems more so than others. But by the end not only did I have favorite poems but I realized the whole collection really captured one of hockey's most intense and contradictory characters. It is obvious that "Poems" was exhaustively researched, but the beauty is how the author then thoroughly re-imagined Terry Sawchuk, arguably the greatest goalie of all time. For all his factual research, Maggs openly admits to taking liberties and using poetic license by getting into the long ago deceased's head. The book is based on the real, but has been masterfully re-envisioned. Despite the combination of fiction and non-fiction "this may be the truest hockey book ever written" suggests , Stephen Brunt, Globe and Mail sports columnist. "It reaches a level untouched by conventional sports literature. His Sawchuk is real." The book is primarily about Sawchuk, of course, complete with sporadic photos. The author delves into the goalie's childhood, glory years and tragic demise. Interestingly the book opens with a snippet from Sawchuk's actual autopsy report. But the book also looks at several other characters, notably goalies, and the Original Six era. More importantly it looks at the game of hockey back then, and particularly examines the game's place in our society. Do yourself a favor hockey book fans - check out Night Work: The Sawchuk Poems. Keep it by your bed stand and read a poem every night. Before you know it you will have greatly enjoyed the best hockey book of the year. What a great site! And I couldn't agree more. This book is magical.